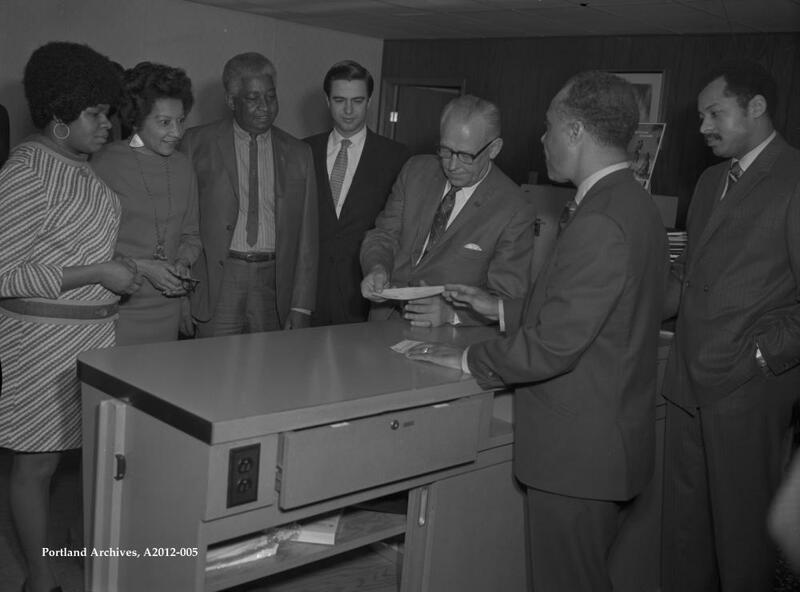 In 1968, a group of businessmen in Portland, Oregon saw the recently founded Bank of Finance in Los Angeles, California as a model for their creating the first black-owned commercial bank in the Pacific Northwest. The businessmen, with help from Los Angeles, founded the Freedom Bank of Finance, which opened in 1969. The African American businessmen in Portland included Realtor Venerable F. Booker, restaurateur Roy Granville, grocery-store owner Silas Williams, and dentist Dr. Booker T. Lewis. All of them felt that a black-owned commercial bank would serve the financial needs of the local black community including providing capital for emerging businesses in the Albina-North Portland district that was home to most of African Americans in the city. Roy Granville, one of the bank’s founders persuaded Onie B. Granville, his cousin and the founder of the Bank of Finance in Los Angeles, to temporarily move to Portland to help establish the new bank. The Portland-based Bank of Finance opened on August 4, 1969 after J.F.M. Slate, the Oregon Superintendent of Banks authorized its organization. The Portland founders and other early investors raised $600,000.00 in stock to finance the new institution. Onie B. Granville who at the time was still on the board of directors for the Los Angeles based Bank of Finance, agreed to serve temporarily as the first president of the new Portland bank. Granville along with Booker, Lewis, Williams, and cousin Roy Granville, became the first board members. The Freedom Bank of Finance was first located at 728 NE Killingsworth Street in Portland. Shortly after its opening Onie B. Granville returned to Los Angeles and Venerable F. Booker became president of the bank. The name was changed later that year to the Freedom Bank of Finance, and in 1971 it was relocated to 2737 NE Martin Luther King, Jr. Boulevard. In 1975 the bank was renamed again to American State Bank. Although it had individual depositors, The Freedom Bank of Portland relied heavily on governmental agencies for much of its working capital. By 1971 the state of Oregon and Multnomah County (where Portland was located) each had $100,000 in interest bearing deposits. For much of the 1970s the bank had an average of $50,000 in Model Cities deposits from the U.S. Government. By 1989, however, the bank began to experience difficulties. At the end of that year American reported $640,857 in problem loans, or 13.5 percent of its total loans. The average for most banks is 2% and anything over 3%, according to bank analysts, is considered dangerous. Despite the problem loans, the bank had net profits of $110,448, up 18 percent from $93,666 in 1988. At the end of 1989, American had $1.8 million in equity capital, or 11.8 percent of its assets, a ratio that far exceeded the federal government’s capital requirements. American State Bank’s success was generally attributed to its longtime president and principal stockholder, Venerable F. Booker who upon nearing his 80th birthday, sold it in 2000 to Albina Community Bank and retired. Through his prudent fiscal leadership, American State Bank, which Booker called, “the bank that integration built,” survived much longer that similar black or non-black banks throughout the nation. “From Ed Warmoth to Mayor Schrunk,” Inter- Office Correspondence, July 23, 1970, pp. 1-4, and Charles Jordan, Director, Model Cities, “Background paper use of Local bank for model cities fund,” July 30, 1970, pp. 1-6, City of Portland, Oregon Archives & Records Center; Karen J. Gibson, “Bleeding Albina: A History of Community Disinvestment” “Transforming Anthropology” Vol 15: 1 (2007) pp. 1-23.